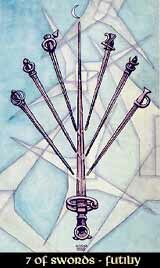 The Seven of Swords show the element with its reigns lose, storming into the realms of anarchy and destiny, fighting against 'nobody knows what', getting entangled in many conflicting tendencies. Now none of the Suits is lucky within the Seven - the Wands burn down, the Cups nearly drown and the Disks are out cold - yet the Swords are least willing to accept their fate and activate every trick and list they can figure to get along. And considering that the Swords are pure intellect, they are embarrassingly good in figuring out tricks.. Therefore, the Seven of Swords can talk of trickery, cheating, sudden affronts, juggling and intentional confusing with unrestrained Mercurian amorality. Though, all the lists are bound to fail, even the clever Swords cannot escape the hand of fate.